The 7th annual World Film Festival of Bangkok kicked off a week ago, but for a variety of reasons I’ve only managed to see three movies so far, including two today. The three films have also delivered three odd coincidences, which I’ll detail as we go along. As usual, I’ll use (perhaps with slight editing) the film synopses that the festival organizers wrote themselves. I’m not sure that synopsis quite captures what a nightmarish film this ends up as. As you might imagine, the bucolic environment is utterly shattered by the sudden intrusion of overwhelming noise pollution. Home essentially chronicles one close-knit family’s descent into insanity as they attempt to cope with, then block out, the deafening highway roar. The breakdowns are varied, but with the inexorable march of automobiles comes each individual’s inexorable march toward madness. Viewers are also taken along this ride, since the noise pollution from the highway contaminates the theater as well (albeit to a lesser extent). Meier does an excellent job transitioning between each of the film’s three sections (normal/loud/quiet, respectively), aided by great cinematography – including two memorable tracking shots. In its depiction of communal isolation, Home reminded me a lot of Dogtooth, also a quiet horror flick. In psychology there’s a concept known as “group polarization” that highlights the radicalizing effects of a group (both peculiar families in these cases). Crazy-pushes-crazy until (as in both films) something finally snaps, creating unpleasant scenarios but fantastic movie-going experiences. Charles is a middle aged business man who runs an inherited company. On the anniversary of his company’s founding, he finds himself suffering from depression and wishes more could be done for the workers. After he expresses his views to a television reporter, Charles leaves home and his business behind. His conservative son is horrified at his father’s behavior when he takes up with an anarchistic couple who push his car over a cliff in a symbolic gesture of material rejection. The man encourages Charles to make love to his wife, but Charles is reluctant. Charles’s daughter sees him with the couple and is delighted he shares in her liberal thinking. His son tries to have Charles comitted to an asylum if he will not sign over control of the company in this satirical social commentary. 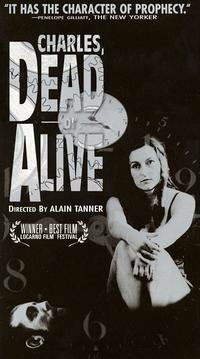 This is actually a B&W film from 1969, part of an Alain Tanner retrospective that WFFB is hosting this year. If I weren’t so lazy I’d re-write the provided synopsis since it’s fairly inaccurate. The couple Charles joins up with (Paul & Adeline) are dropouts & bohemians, but not anarchists. It’s Charles’ daughter, herself an anarcho-Marxist, not a liberal, who pushes the couple (and Charles) toward political extremes. Part of this means requiring Paul (who looks like Ryan Futrell channeling Brad Garrett) to memorize various slogans & quotes popularized in May 1968, whose events loom large over this film. Richard Porton points out the particular significance for Switzerland: “[T]he film’s cynicism about work also constitutes a critique of Swiss bourgeois complacency… the demise of the once vibrant Swiss anarchist movement coincides with a sweeping transition from a society of small craftsmen to mass industrialization.” This mass industrialization, including its attendant “car culture,” is what Charles specifically rejects. It’s here that we have Coincidence #1 in that both Home and Charles, Dead or Alive focus on the automobile as emblem of contemporary ills. In both movies the removal/destruction of the protagonist’s car signals a profound shift in their thinking. Charles, Dead or Alive makes the critique of car culture explicit by having Charles quote Henri Lefebvre just before Paul triumphantly and symbolically pushes the vehicle over a cliff. It’s a great scene in a movie that is otherwise lacking in them. The dialogue & script is excellent, the characters & ideas intriguing, but the whole thing is a little too plodding (and the flute/piccolo soundtrack too unbearable) for me to truly love this film. Here we come to Coincidence #2, which is that both Charles, Dead or Alive and Father of My Children quote the philosopher Walter Benjamin. I can’t remember what’s quoted in the former, but in Father of My Children they reference a painting by Paul Klee, about which Benjamin famously wrote: “[Angelus Novus] shows an angel who seems about to move away from something he stares at. His eyes are wide, his mouth is open, his wings are spread. This is how the angel of history must look. His face is turned toward the past. Where a chain of events appears before us, he sees on single catastrophe, which keeps piling wreckage upon wreckage and hurls it at his feet.” In Father of My Children the wreckage piled upon wreckage are Gregoire’s failed films & struggling projects. The fall of Moon Films provokes a single catastrophe, delivered by Hansen-Løve with aching matter-of-fact style. This tragedy was inspired by the real-life fate of Humbert Balsan, a French producer. 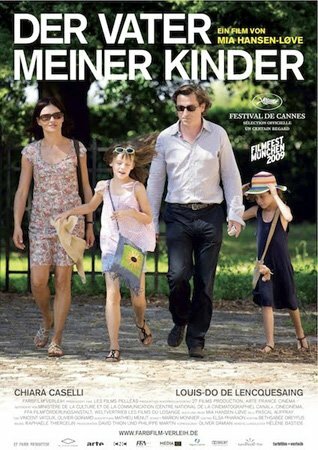 There’s a compelling, if familiar, story here, but the film ultimately fails to fully deliver. On the one (better) half we have an intriguing family drama; in the other (less interesting) half we get a story about the efforts to save Moon Films. I appreciate that Hansen-Løve¸ve forsook cheap melodrama, but she could’ve avoided this while still zeroing in on the movie’s real strength: the Canvels and the excellent actors/actresses that comprise it. Oh, and what about Coincidence #3? Well when I walked into the theater this morning, before they played the King’s Anthem (which I love) they played a PSA involving Thai kids singing Que Sera, Sera. So this was the start to my day, and remarkably my day also closed with Que Sera, Sera as that was the closing song over the last shots & credits on Father of My Children. Edit: Months later I saw Que Sera, Sera featured prominently in Mary and Max. So a song I haven’t heard in probably 15 years somehow shows up in cinema three times in as many months. Bizarre. Que Sera, Sera reminds me of our Capetown house for some reason. Specifically the dining room. Weird. where do you find these films? They were showing at a local mall here in Bangkok as part of the World Film Festival.